You’ve heard “dinner and a show.” You’ve heard “dinner is the show.” But what’s all this talk about dinner when drinks can be entertaining, too?! Our team here at BG Events and Catering recently competed in the Movers and Shakers April Cocktail Competition against Boston’s best restaurant mixologists. We entered with a Boston original: our BG Dr!nk Wall. 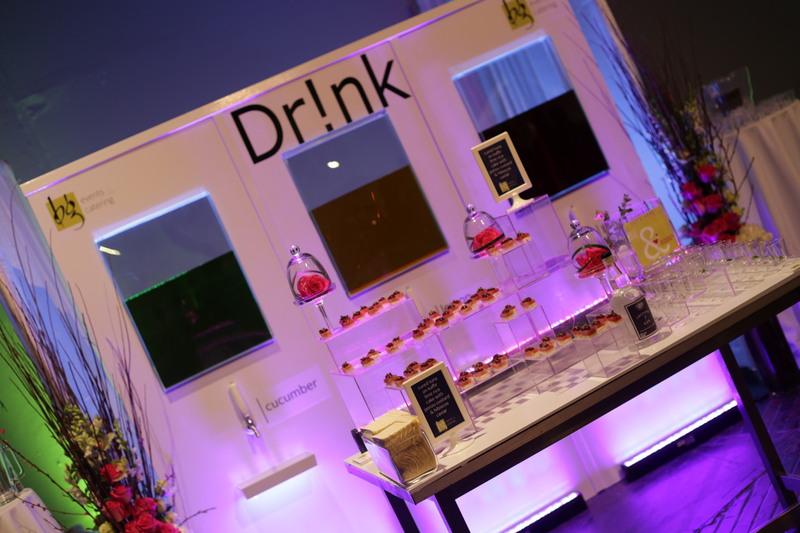 We premiered our Dr!nk Wall at the Boston Center for the Arts, and couldn’t believe the crowd’s reactions to the innovative extension of our beverage brand. They couldn’t stop smiling! Will be the talk of the event! In the photos below, you’ll find the first three beverages ever served in a Dr!nk Wall, concocted by our own Beverage Developer and served to eager guests: cucumber, lemon ginger tea and blackberry thyme. We paired these beverages with Chef Tony’s Cured Tuna on a Kaffir Lime Rice Cake with Ponzu Custard and Hibiscus Caviar. Can you imagine what your guests will say when they show up to your next event and see a Dr!nk Wall?